I found myself taking a tour of Glendale this past weekend and was in dire need of some good Mexican food eats. So I hopped on my trusty Yelp iPhone app and searched for the best Mexican food in Glendale. A little place called Pedro’s Mexican shows up with an overall positive review, so I figure I might as well stop by and see what this place is all about. I pull up to Pedro’s which is not too far from the intersection of N 51st Ave and Glendale Ave, and see that the mini-parking lot of about 12-15 spots is just about at capacity at 3:30 pm on a Friday. I’m starving so I’m hoping there isn’t much of a wait. 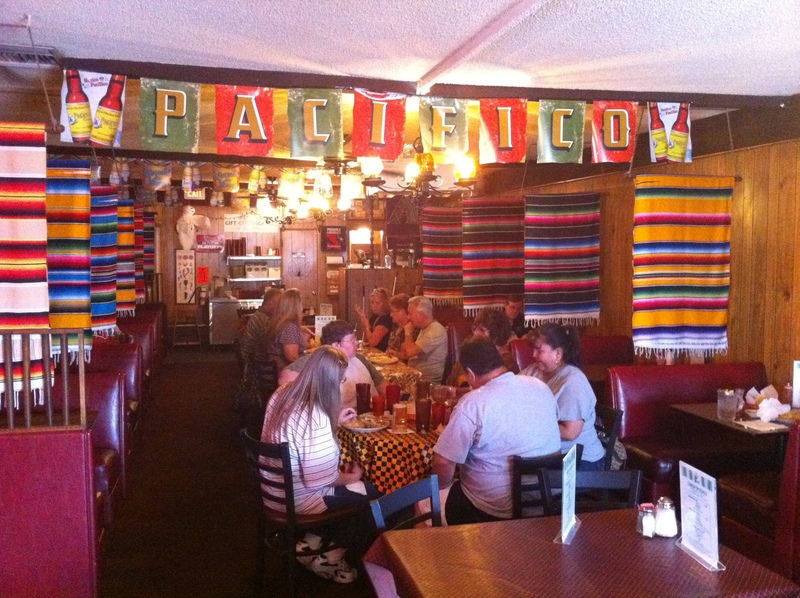 The inside of Pedro's Mexican Restaurant in Glendale, AZ. Photo by Michael West. Much to my delight, I see that there are only a few tables and booths occupied, so I’m able to walk right in and sit down to eat. 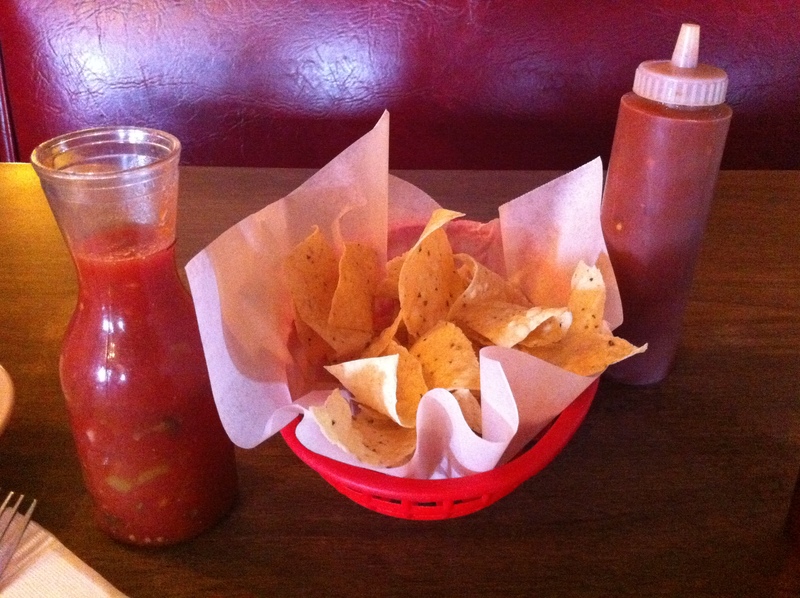 Upon sitting down, I’m instantly greeted by my waitress who takes my drink order and returns with a bowl of Pedro’s complimentary chips and salsa… cha ching! Complimentary chips and salsa? Oh hell yes! Photo by Michael West. The salsa has a good liquid base with not too much of a kick to it, and the chips are golden and crunchy, just the way they should be. Along with the chips and salsa, the bottle you see on the right is filled with hot sauce… something I know I’ll be using in the near future. 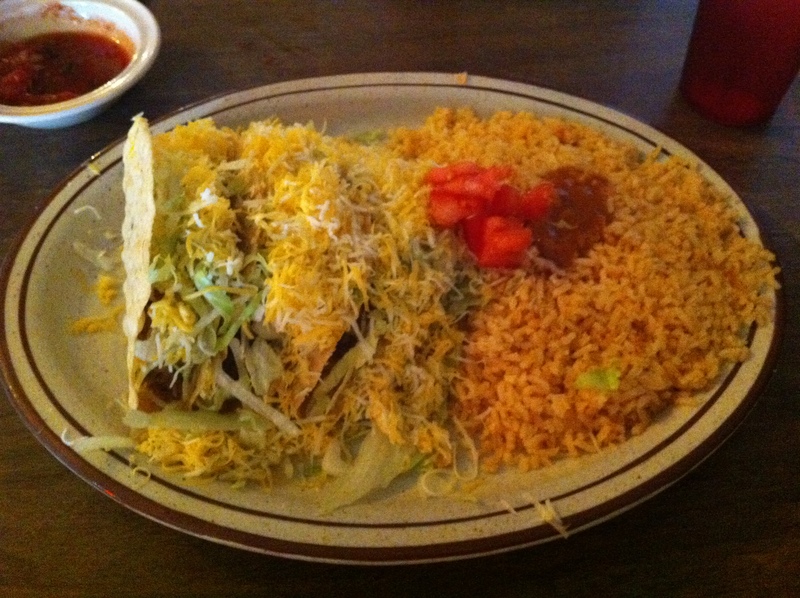 The waitress takes my order and I opt for the three taco combo. For the meat in my tacos, I go for shredded beef, and order double rice to round out my combo order. I wait maybe 15 minutes for my food to come out, snacking on the chips and salsa like a menace along the way, and when I see the plate I ordered, you’d think I just saw Santa with my blown away facial expression. The three taco combo... this is about to be an adventure. Photo by Michael West. Honestly, I only have one word on my mind when I see this big ol’ combo in front of me. See? I told you I couldn’t say it better than that! But yo! These tacos are straight loaded! Tons of beef, tons of cheese, and tons of lettuce… not mention I’ve got enough rice to feed all of Rhode Island for a week. I had to squirt some hot sauce into these tacos to top off my taco-eating experience… so let the games begin! The first bite of shredded beef is straight up heavenly, and can already tell that I’m not going to want to leave this place. The tacos are absolutely DELICIOUS. Don’t get me wrong, the shredded beef at Mi Patio was good, the shredded beef at Carolina’s was good, but Pedro’s takes the cake for “best shredded beef taco” I’ve had in the Valley since I started my little Mexican food quest. The tacos were packed with flavorful shredded beef and every bite was as delectable as the last. The rice was fantastic as well, and just had that authentic appearance and taste that I always find myself longing for. By now, I’m stuffed and can’t even think of eating another bite. But damn, what a good meal it was. 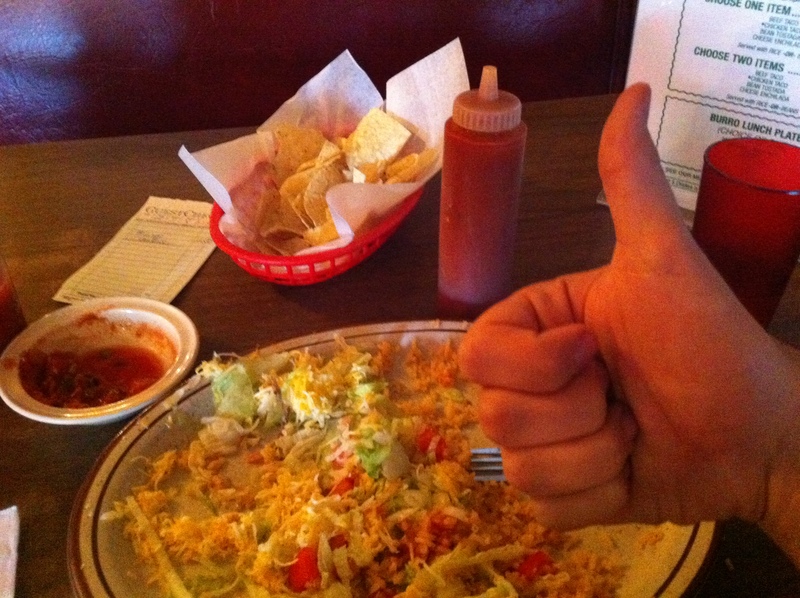 Pedro's three taco combo gets a thumbs up from me! Photo by Michael West. My combo plate checked out at just under $13 without tip, but considering the mammoth portion I had, it was a pretty freakin’ good deal. If for whatever reason I find myself heading up the 17 freeway again, I’ll for sure hit up Pedro’s again. 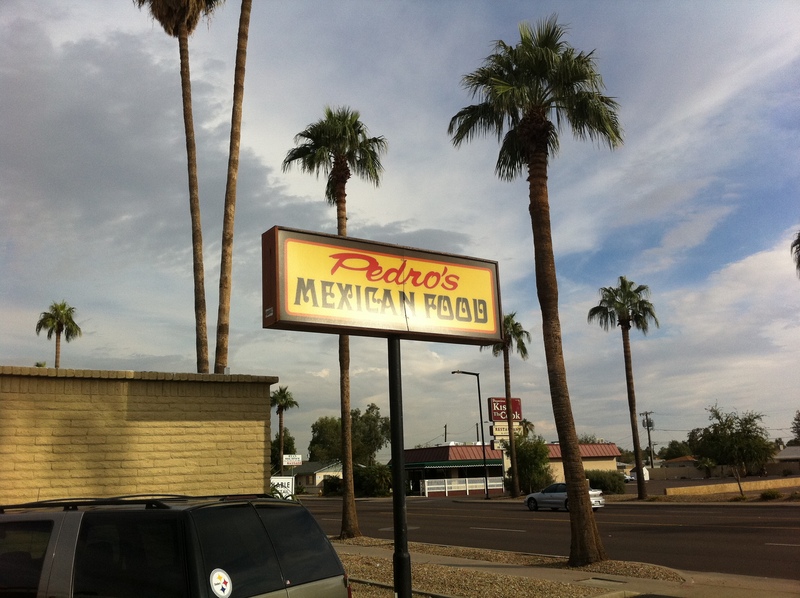 With friendly service and an atmosphere/set-up that reminded me a lot of my favorite Mexican food place back home (Mi Casa in Costa Mesa, CA), I definitely enjoyed my stay at Pedro’s. Overall: 8.75 out of 10.